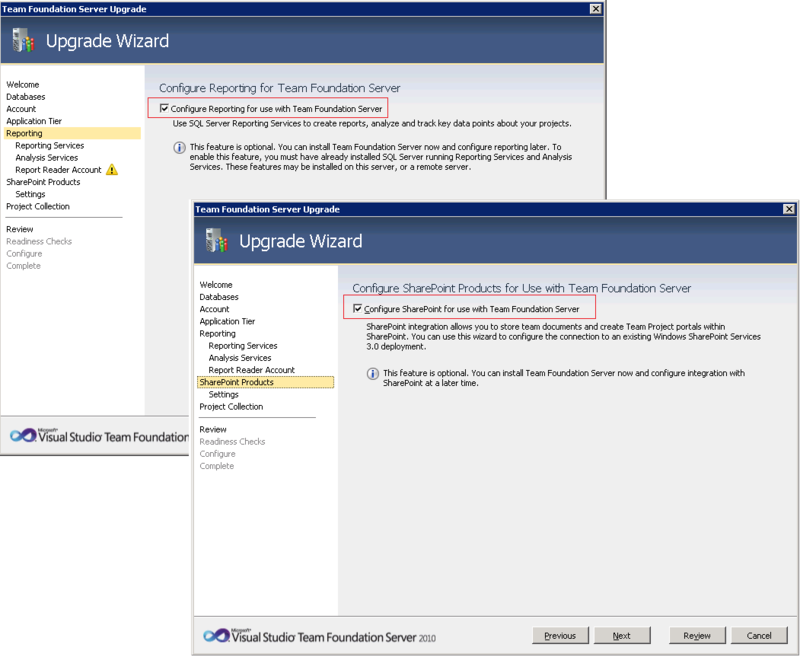 One of the nice things about Team Foundation Server 2010 upgrade is that it’s so flexible. One of the bad things about Team Foundation Server upgrade is that it’s so flexible. If you want, you can skip adding reporting or a SharePoint portal during upgrade. This might be helpful if your team never used reporting or the SharePoint portal prior to upgrade, and you can’t imagine using either of these features with the upgraded project at any time in the future. But here is the catch: If you do skip adding either of these features during upgrade, you won’t be able to use them with the upgraded project (see the Tip under, “Portal Server and Reporting Upgrade Options”). This means that you can’t create reports from data in the upgraded project and you won’t be able to use a portal. You can add these features after upgrade, but you will not be able to easily get your upgraded projects to work with them. New projects are a different story. You can use reporting and SharePoint with new projects, even if you don’t add reporting and SharePoint during upgrade. I’ve heard of a few customers who ran into a problem with their SQL Server or portal during upgrade and thought: I’ll just add it after upgrade. That won’t work. If you know you want to create reports or use a portal with the upgraded project, you must not skip adding them during upgrade. Categories: Tips | Tags: guidance, IT Pro, MSDN update, server administrators vs. developers, team foundation server 2010, tips, upgrade TFS | Permalink.